Our Summer School Blues bag isn't just for school. This large barrel bag has plenty of room and lots of pockets. There are 4 outside pockets. 1 that zippers, and 3 that have a Velcro flap closure. The inside is black cotton lined, with 1 pocket. It has a zipper closed top with a button closure for added security. 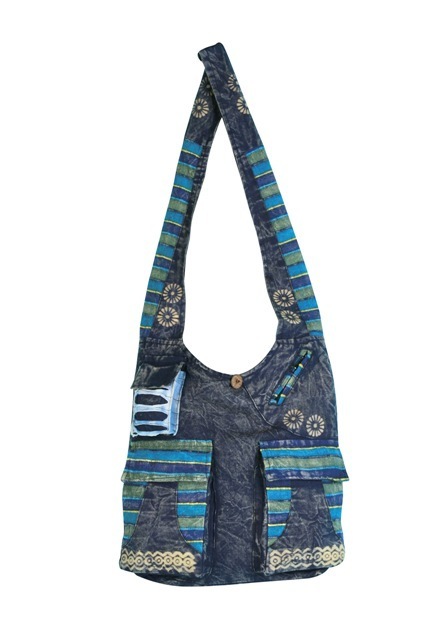 This bag is 100% cotton and comes from a fair trade coop in Nepal. Approximate size of this purse is 15"x 14".